Big Mouth bottles are solvent-proof for all airbrush paint mediums. The domed, high-strength one piece cap with offset friction fit connector easily affixes onto an airbrush. The raised air intake creates a splash-proof opening. The detachable pick up tube makes the cap easy to clean. The Crystal Clear Bottles for water-based paints reveal actual paint colors. The no-rust metal friction fit connector easily affixes onto the airbrush. Comes with an Iwata Redi-Cap to store or transport paint. The High Strength Translucent Bottle with adaptor cap is solvent-proof for all airbrush paint mediums. The no-rust metal friction fit connector easily affixes onto your airbrush. Comes with an Iwata Redi-Cap to store or transport paint. Fast-Blast caps have a straight, one-piece paint-passage tube that ensures easy cleaning and is leak-proof. All plastic construction means no rust and that it is solvent-proof, and no gasket guarantees against deterioration. The friction-fit joint securely holds bottle to airbrush. 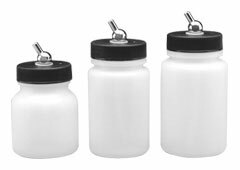 Sets include one bottle or jar and the corresponding cap.